If you love Halloween as much as we do, you probably insist that every member of your family get involved with the festivities. So, after you've chosen your costume, your spouse's costume, costumes for all the kids, it's time to think about the dog. That's right. If you're a real Halloween enthusiast, no one is allowed to remain costumeless when you're in charge of the occasion--not even the furriest member of your family! So, what theme do you want to use for Fido this year? Superheroes perhaps? Classic characters? How about hilarious costumes? Some of the funniest pet costumes on the planet are available in a wide variety of styles and sizes at HalloweenAdventure.com and because our selection is so massive, we've decided to help you out by giving you some hilarious costume ideas. The Joker: Watch out, Batman, the Joker has revamped his image yet again! 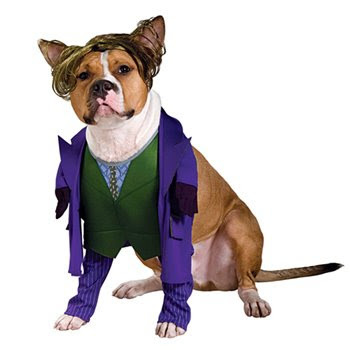 The Joker pet costume features a cool Joker "wild hair" headpiece and a purple coat Joker jumpsuit. Make no bones about it, this mischievous misery maker is ready to sink his teeth into mayhem! Jurassic Bark: Your pampered pooch will look fearsomely ferocious in our Jurassic Bark dinosaur pet costume. Who says dinosaurs don't make great pets? Nun: If your furry friend doesn't listen to you, perhaps she's listening to a higher power. If this is the case, our Nun pet costume is sure to make her feel Divine! Skeledog: Perhaps you like your pet costumes a bit more classic. No problem! Keep it classic and give your dog a bone in our cool Skeledog costume! It features a black, skeleton print t-shirt and is value priced at under $12.00. Watch Dog: Make time for your pooch and have the watch dog of your dreams with our hilarious Watch Dog costume. This adorable costume features a tunic with an enormous watch face on the back. Raggedy Ann: If your cute canine is a living doll, make it known to the world when you dress her in our incredibly impressive Raggedy Ann costume. This adorable costume features a white mop cap with attached yarn hair and a blue dress with white floral print. Want to see more hilarious pet costumes? 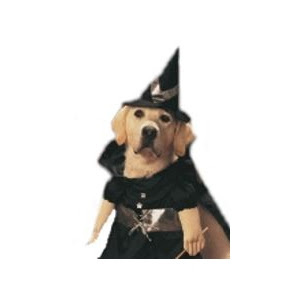 Then check out HalloweenAdventure.com's Pet costume department. Here you will find funny costumes, cute costumes, scary costumes, and superhero costumes for your dog or cat and you'll be blown away by the incredibly low prices. Each of the pet costumes featured above can be purchased directly from HalloweenAdventure.com for under $20.00 and if you purchase them before the Halloween shopping rush begins, each and every costume is eligible for return or exchange. So what are you waiting for? Halloween is just around the corner and the coolest pet costumes are just a click away! Make this Halloween a hilarious adventure with HalloweenAdventure.com!